This spectacular quilt believed to have been created by Emily Munroe, in about 1865, is a treasure. 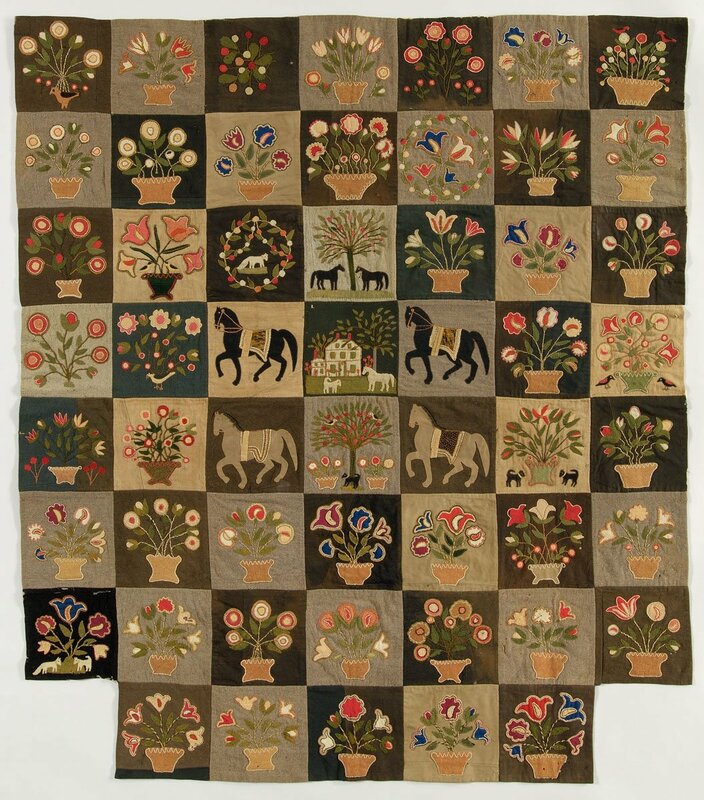 It measures approximately 59" x 68" and consists of 54, 8 1/2" folk art blocks. Although the backgrounds of the blocks consist of different fabrics including wool, twill, and cotton, the quilt is basically considered a wool quilt. This pattern has been lovingly created by Froncie who has isolated every block in the quilt, giving each its own page. The original stitches are described, many of which can be clearly seen in the color picture shown of the actual block. In addition, each block has its own page of line drawings to be used as templates. Typical of Froncie's patterns, it also includes the history and instructions - including graphics of various stitches to use - printed on beautiful parchment paper. Detail close-up pictures and a laminated Color Chart are also part of the pattern. In addition, a beautiful mother of pearl "thread keep" (threads shown for display only) and a magnetic "needle minder" are added to make this historic pattern even more unique. Packaged beautifully in a ribboned box to hold both the pattern and your collection of fabrics, Froncie's two-year project is finally complete and will be a beautiful addition to your historic collection of patterns. Click the thumbnails to see the images larger!